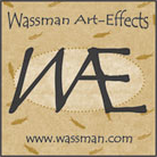 Wassman Art-Effects is owned and operated by the Wassmans: Tim, Donna, their son Chris, and his wife Kathy. They are a family of northwest carvers known for their distinctive and unique carvings using fossil mammoth and walrus ivory, and rare exotic hardwoods from around the world. These ancient materials are used to create one-of-a-kind art; such as: sculptures, wall masks, exquisite vessels and carved knife handles. Their skillful creations often combine intricately carved ivory pieces with the resplendent beauty of the hardwoods. Their line of jewelry incorporates fossil ivory, amber, semi-precious stones and silver into stunning necklaces, bracelets, earrings, pins and pendants. Visit the Wassmans' gallery at Taiya River Arts in Skagway where you can view their beautiful selection of artwork as well as a variety of creations from other artists. Tim Wassman, patriarch of the family & father of Wassman Art-Effects, began his art career at 17, using interesting and unusual pieces of wood he found in the forest to create functional sculpture and jewelry. By his early twenties, he was working with talented carvers in southern California, and after marrying his artisan wife, Donna, in 1978, became a wood and fossil ivory craftsman in earnest. Since then, they have sold their artwork to over thirty Alaskan galleries, opened two of their own, and have had showings from Beverly Hills to Manhattan. In 2011, they were invited onboard the Silver Shadow, a prestigious cruise ship that is the floating home to priceless works of art, to sell their families sculpture and jewelry to art-collectors around the world. After their final docking, Tim built his own forge and is exploring the integration of cable Damascus knives and sculptural pieces into his work, using techniques that surprise even virtuosos of the craft. Over the last thirty years, together, Tim and Donna have done the impossible: become renowned, Alaskan artists with two generations of family at their support, and stayed in love through it all. In 1996, Chris Wassman made a life changing decision. It was shortly after his son’s first birthday, and the announcement of their second child on the way, that he decided he wanted to be a work-at-home father and husband. Since that moment, he has been a dedicated advocate for his family's business, making its' success a priority second only to the happiness of his wife & children. Raised by artists, Chris has always had a love and talent for crafting, and found his place in the business by hand-turning beautiful hardwoods into a variety of vessels and bowl, and single-handedly producing ___out of Homestead's 157 products. He has an eye for dynamic color and humble perfection, and every piece he creates has a story worth sharing. As a natural talent, a storyteller, and a family man, Chris Wassman is a light whose unmatched work ethic has guided his family dutifully, and always with love and endless laughter. From the founding of Wassman Art-Effects in 1997, to the opening of their beautiful Taiya River Arts gallery, Kathy Wassman has been an inspiration to her business, fellow artists, and family. She is an artisan of the intricate, and it shows it in the meticulous crafting of her "New Tribe" macrame necklaces, the careful finish of her carved, ivory pendants, and the striking stylistic choices that single-out her jewelry sets. Using this talent for detail, Kathy created Taiya River Arts' first true sterling stylistic choices that single-out her jewelry sets. Using this talent for detail, Kathy created Taiya River Art's first true sterling silver pendant line, a series of four totemic carvings meant to symbolize Alaska's seasons, which have since become a best-seller. As an artist, she is always exploring her medium, and into her home and business life brings these qualities of creativity and positive change.